My morning paper yesterday was sheathed in an advertisement from Welch's Grape Juice. There were two parts to the ad. The first part detailed new Welch's sugar reduced grape juices, while the second extolled the fact that the Heart and Stroke Foundation's Health Check has been applied to their 100% grape juice. Q. Do you think Coca Cola is a healthy beverage? A. Of course not, it's high in calories and sugar with no nutritional benefits. Q. How about if I took Coca Cola and added in some vitamins? A. No, still not healthy - lots of sugar, and lots of other preservative type stuff. Q. How about then I just take a glass of pure spring water, add to it 10.5 teaspoons of sugar and then a few vitamins - would that be a healthy beverage? A. 10.5 teaspoons of sugar in water a healthy beverage? You've got to be kidding me. You could put in all of the vitamins in the world, drinking a cup with 10.5 teaspoons of sugar simply isn't healthy. Q. Then how come the Heart and Stroke Foundation's Health Check program has endorsed Welch's 100% grape juice? A. Because Health Check doesn't care about calories and apparently doesn't bother to critically appraise or apply sound science to their nutritional criteria. 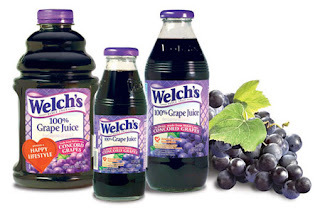 Welch's 100% red grape juice has 42.5 grams of sugar per glass and contains 170 calories per serving. That's 10.5 teaspoons of sugar per day, is glass per glass almost double the calories and sugar of a glass of Coca Cola, and if you drink a glass daily (or worse yet, give it to your children) that's almost 18lbs worth of grape juice calories per year. Sounds super healthy to me. Welch's has come up with a calorie reduced version of its grape juice. It's partially sweetened with Splenda and it has only 70 calories per glass and only 4 teaspoons of sugar. Sounds a lot better right? Maybe that should get the Health Check rather than the 10.5 teaspoons of sugar and double the calories and sugar of Coca Cola version right? Health Check's criteria require that juices all be 100% juice so the lower calorie light versions do not qualify. When are the Heart and Stroke Foundation's dietitians (and Health Canada's for that matter) going to recognize calories as a valuable nutritional component, and when are health professionals finally going to admit that a glass of sugar is a glass of sugar, whether god made the sugar or man made the sugar drinking a glass of sugar with vitamins in it is NOT a healthy choice.